Many customers and competitors have asked us to verify some of the claims that are made regarding the quality of Legacy Food Storage, most frequently regarding the Non-GMO and Gluten Free claims. We are very pleased to announce that Legacy Food Storage has partnered with Honeyville to continue to produce their already amazing products. Honeyville has some of the highest rated facilities in the country when it comes to quality and standards of the food products that they produce. 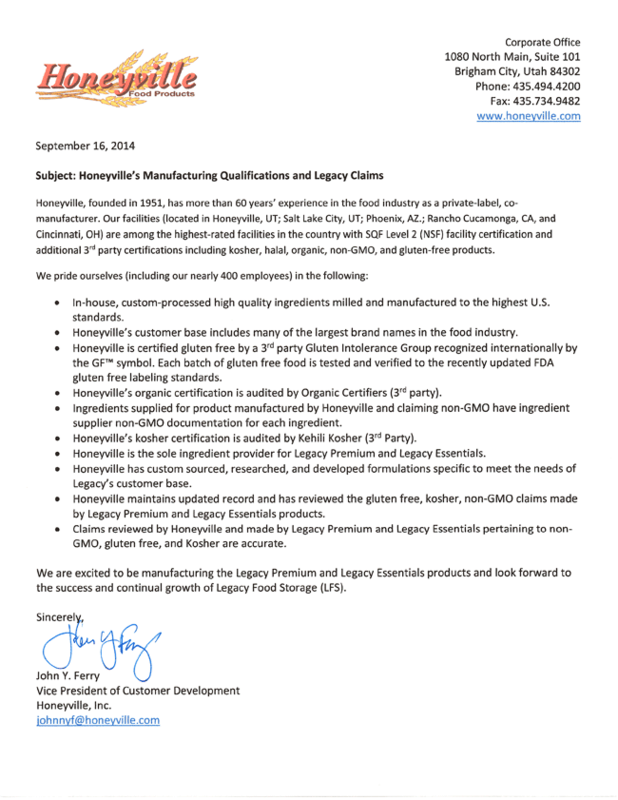 Please read the letter below to verify that Legacy Food Storage is completely accurate when they state their food storage products are Non-GMO and Gluten Free. Interested in our Quality Control Process? Click Here.